Reviews can be a thorny subject for many marketers and business owners. When you get a good one, you feel on top of the world. However, with research showing that around 8 out of 10 consumers trust online reviews as much as personal recommendations, a bad review can be more than just embarrassing. It can be a major reputation headache and end up costing you money in the form of lost sales. Of course any issues arising from a bad review need to be addressed, but once that’s done you also need to make sure people see your good reviews first and foremost. Your first tactic to fight bad online reviews and stop them derailing your business is to actually deal with any bad reviews individually and then address the root cause to stop it happening again. Try approaching your customer if the issue has been resolved and ask them to remove or update a poor review. If the issue isn’t resolved, acknowledge the review, be apologetic for their experience and offer to make good. Once that’s done, look at what caused the negative review in the first place and take measures to fix it. Is it the result of poor customer service for example? More training may be the answer. Is it due to your returns policy? More flexibility may be needed. If the review is in breach of the review site’s code of conduct, you may be able to get it removed. With the review dealt with, the source of the issue identified and changes to processes or policies made as appropriate, you can get on with the following tactics to lessen the impact of the negative reviews and flag up the positive. If you rely on star ratings for your reviews, or only accept reviews on sites that have limited review formats, it may be time to branch out. Adopting a format which allows for more detailed reviews and individual ratings for different aspects of your service is a good way to fight poor reviews. If a customer found your shipping to be slow for example, or faced a long wait to speak to a customer service representative, they may be tempted to leave a poor review. With a more granular format, they could give a lower rating for shipping or customer service, but a five star rating for a product they loved. Amazon and TripAdvisor’s review systems, which allow consumers to leave a star rating and a comment, are both good examples of a more comprehensive format affording a more balanced rating. UK retailer John Lewis allows the buyer to comment and leave ratings for specific aspects of the product. Register for review sites which have a broader format, with the option for the customer to leave a comment and a star rating or rate individual aspects of your service, rather than platforms that use star rating and thumbs up or thumbs down alone. Having a poor review against your business name can be worrisome, costly and a source of annoyance, but if you have better reviews elsewhere it doesn’t need to be the end of the world. Fight the negative reviews by making the most of the reviews where you look great. Society6.com is a website which allows artists to sell their work in a range of formats such as prints and blankets. 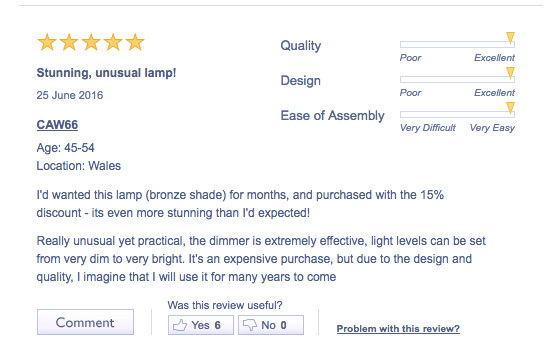 It has a 5.8 out of 10 star rating on TrustPilot, which would have you believe the products and service are average. However, if you look beyond the star rating, you’ll see that rank comes from just 120 reviews. In comparison, Society6 is rated 4.4 out of 5 by 1045 reviews on Sitejabber - telling an entirely different story about the quality of Society6’s offering. If you have poor ratings on one review site and stellar ones on another, you can fight the poor reviews by drawing more attention to the better reviews on other sites, highlighting exactly why customers should choose you, and consequently, helping you win more business. You’ll need to employ some SEO strategy for this tactic to be successful – such as linking to the better reviews page from your site, directory listings and social media channels. Society6 could also encourage their customers to add their new reviews to Sitejabber rather than TrustPilot. Fighting bad reviews can be as simple as highlighting your better reviews, so showing your company in a more positive light. Make it easier for prospects to find your good reviews and push down the visibility of the less than favorable feedback by repurposing the good across multiple channels. You can create images from good review quotes to use on Instagram, Facebook or Pinterest for example. You can also use good reviews to create new website content, such as a ‘what customers are saying’ page. Most businesses receive a poor review at one time or another. However, if you arm yourself with strategies to make the most of your good reviews, understand how to address poor reviews and play to your strengths by maximizing platforms with better feedback, you can lessen their impact and win more business along the way.